It was exactly 20 years ago on Janmastami in 1983 that we officially opened our big “new” temple in Burnaby. It was a grand celebration. A then record number of at least 600 to 700 guests attended. Of course the opening of the new temple wasn’t the beginning of the Hare Krishna movement in Vancouver. In fact it was as early as 1967, less than a year after the Hare Krishna movement was founded in New York in July of 1966, that His Divine Grace A.C. Bhaktivedanta Swami Prabhupada began corresponding with a Mr. S.B. Renovich of Burnaby. The early years of trying to establish Krishna Consciousness in Vancouver were very difficult. The devotees met all kinds of opposition. At one point it seemed that everyone from irate landlords to antagonistic citizens were opposed to the “Hare Krishnas.” The police had even arrested the devotees while performing the age-old process of congregational chanting the holy names of the Lord in public. They were accused of creating a nuisance in public. This wasn’t uncommon either. In the Vancouver Sun, Oct. 16th, 1976, the following article appeared. “Nine members of the Hare Krishna sect will go on trial Dec.1st. charged with creating a public disturbance by singing and dancing in Stanley Park.” When the news appeared in the local papers, a few sympathetic Hindus wrote in defense of this injustice but is was a kind Jewish lawyer freely volunteering his services to defend this religious rights issue who actually won the case, with the help of Lord Krishna of course. The doors were officially opened and the performance of street Harinama Sankirtan continued on the streets of Vancouver. With the increased street chanting more devotees began joining and it wasn’t too long after that the devotees outgrew their humble center on Raymur Street and had to find a new place for their temple. A large house on West 16th Ave. that was up for rent proved to be a suitable place for Krishna Consciousness to expand even further in Vancouver. Once again Radha Madana Mohan came back to the temple on West 16th, where They inspired many more new devotees to fully take up the mission of Krishna Consciousness. In 1978, with the help of some of our growing Indian Hindu congregation a large property in what then seemed to be way out in the country on Marine Drive in Burnaby was purchased. Once again Sri Sri Radha Madana Mohan took up a new residence there in a small building transformed into a beautiful temple. The original name of New Gokula from the Bridesville farm was transferred there. It was shortly after, that the construction on the proposed new temple began. 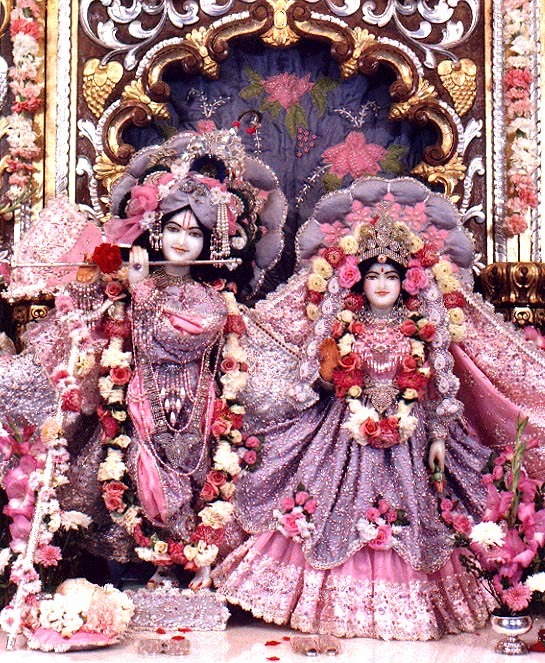 Then on Janmastami 1983, Sri Sri Radha Madana Mohan were installed in Their new temple building. Since that first official Janmastami with the newly built temple twenty years earlier, by the grace of Their Lordships, Krishna Consciousness is still growing. Our Janmastami festival especially draws incredible numbers of guests estimated at more than ten times more than when we opened that temple. The beautiful “new” temple isn’t quite so new as it was then or is it quite big enough to serve our present needs any longer. Srila Prabhupada all along had a vision for Krishna Consciousness for his Vancouver center. What his vision is for the immediate future may not be revealed to us at present but I am confident that it is something extraordinary. On this 20th anniversary of the opening of our Sri Sri Radha Madana Mohan temple, I would like to have every one of you to consider the vision of what the future holds for our worshipable Lordships Sri Sri Radha Madan Mohan and Krishna Consciousness in Vancouver. Sri Sri Radha Madana Mohan Ki Jaya.